The fire service is broken up into two divisions: paid career firefighters and volunteer firefighters. There were approximately 1,100,750 firefighters in the United States in 2005, according to the National Fire Protection Association. Approximately 305,150 career firefighters and 795,600 volunteer firefighters work for public fire departments. These employment totals do not include state or federal government firefighters or private fire brigades. More than nine out of every 10 career firefighters work in municipal or county fire departments that protect 25,000 or more people. Some very large cities have several thousand firefighters, while small towns might have only a few. The remainder work in fire departments on federal and state installations, such as military bases and airports. Private fire brigades employ a very small number of firefighters. Most volunteers work for departments that protect fewer than 25,000 people. More than half of all volunteer firefighters are located in small, rural departments that protect fewer than 2,500 people, according to the National Volunteer Fire Council. The number of volunteer firefighters is decreasing every year. As suburbs continue to extend into rural areas, municipal fire departments that employ career firefighters are developed to better serve the growing needs of the communities. Another reason could be the amount of time being a volunteer firefighter demands. Municipal fire departments or fire districts are headed by fire chiefs, who are responsible for the administrative and technical work of planning, organizing, and directing the municipality’s fire-fighting and fire-prevention activities. Chiefs also are responsible for training, staffing, budgeting, and all other administrative matters. They are in charge of developing and improving the department, as well as keeping abreast of changing local conditions and technical changes in the industry. Fire administrative officers, who help with the department’s business-management activities, sometimes assist chiefs. Next in command are deputy fire chiefs, who are responsible for the department’s administrative and supervisory duties, including organizing platoons and scheduling shifts. They also deal with departmental discipline and relieve chiefs during sick leave, time off, and vacations. Platoon chiefs organize platoons, schedule shifts, and carry out administrative duties and clerical tasks. Battalion chiefs are responsible for commanding the personnel, equipment, and apparatus of one or more fire stations. They also coordinate apparatus maintenance. At an emergency scene, battalion chiefs command and instruct the firefighters. Fire captains or lieutenants command the various shifts. At fire scenes, fire captains organize incident command. Platoon chiefs, battalion chiefs, captains, and lieutenants also fight fires. Other fire department positions include the following. Driver/operators drive fire apparatus, such as pumpers or aerial ladders, to fire scenes. Firefighter/paramedics have advanced emergency medical care responsibilities along with fire-fighting duties. Depending on the nature of the emergency, these personnel provide advanced life support, perform extrication and rescue, or act as firefighters in fire-suppression or hazard-control activities. Firefighter/ EMTs also perform dual roles and can provide basic life support as well as fire-suppression activities. 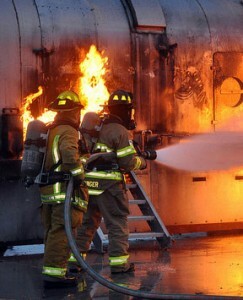 Firefighters combat, extinguish, and prevent fires. They connect hoses to hydrants, operate pumps, apply water or other extinguishing agents through hose lines and nozzles, and position ladders. Firefighters also ventilate smoke-filled areas, operate heavy equipment, and salvage building contents. At emergency scenes, all fire personnel wear turnout gear, which includes bunker boots and coats, gloves, and helmets that are made from fire-resistant material, to protect them from the fire. They also use self-contained breathing apparatus (SCBA), which are like scuba tanks, to breathe in clean air even in smoke. 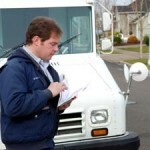 Several departments also require their personnel to use personal alert safety systems (PASS). These devices help monitor the firefighters while they are in burning buildings and set off an alarm if a firefighter is motionless for 30 seconds. Because it is virtually impossible to see in a smoke-filled room, some fire departments use handheld, thermalimaging systems. These devices measure the heat from a person’s body to provide a better picture of where victims are trapped in burning structures. When they are not on emergency calls, firefighters inspect buildings for any hazardous conditions that could cause fires. Armed with knowledge of fire hazards, as well as local fire and building codes, they check exit routes, the storage and use of flammable and combustible materials, overcrowding of public places, and the improper use of equipment or materials in buildings. Firefighters also conduct practice drills, attend training courses, and take care of other required station duties. Firefighters maintain the trucks and equipment used to fight fires. Many different vehicles are used depending on the size and location of the department, including pumpers, which carry hose and nozzles; tankers, which carry extra water supplies; aerial ladders, which have pumps and hose beds as well as long ladders with baskets and nozzles for fires in tall buildings; and rescue vehicles, which transport axes, pike poles, reciprocating saws, blankets, and automobile-extrication equipment. Other kinds of apparatus include incident-command vehicles, hazardous-materials units, and fireboats. Almost all fire departments have special teams for operations such as hazardous-materials spills and search/ rescue missions. Depending where the department is located, it might also perform the following functions: terrorism response, high-rise fire fighting, and disaster response (including floods, tornadoes, hurricanes, and earthquakes). Some departments, particularly in the western states, are trained in wildland fire fighting. Wildland firefighters work to combat the massive fires that occur in forests. Drought, heat, and wind dry out trees and grass, making them easier to catch fire. Dried grass, leaves, and light branches ignite easily, and fire spreads quickly between them, often generating enough heat to ignite heavier fuels, such as tree stumps and heavy limbs. If the blaze covers a large area, local departments can be called in to assist firefighters who work for the U.S. Forest Service and are stationed in the nation’s forests. These firefighters locate fires from remote fire-lookout stations and report their findings to headquarters by telephone or radio. Fire rangers also patrol areas of the forest to find and report fires and hazardous conditions, as well as to ensure that travelers and campers comply with fire regulations. When fires break out, an elite corps of firefighters, known as smokejumpers, battle the blaze by parachuting from airplanes to reach inaccessible areas. Helicopters outfitted with large buckets (from 72 to 2,600 gallons) dump huge amounts of water on burning areas.